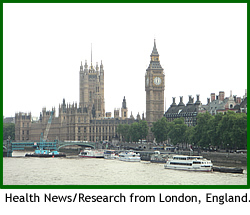 Click for more News from or about London. See also Books about London, England. According to a recent statistical review led by researchers at University College London (UCL), people with symptoms of slowing minds - formally termed 'mild cognitive impairment' (MCI) are statistically more likely to go on to develop dementia if they also have diabetes or psychiatric conditions such as depression. (See also other news re. depression). Mild cognitive impairment, which is sometimes referred to simply as MCI, is a state between normal ageing and dementia, in which the person's mind is considered to be functioning less well than would normally be expected for their age. It has been estimated to affect approx. 19% of the population aged 65 and over. Statistics suggest that around 46% of people with MCI develop dementia over the next 3 years, as compared with 3% of the general population. The recent review paper by academics at UCL was based on analysis of data from 62 separate studies, following a total of 15,950 people diagnosed with MCI. The study found that among people with MCI, those with diabetes were 65% more likely to go on to experience dementia and those with psychiatric symptoms were more than twice as likely to develop dementia.
" There are strong links between mental and physical health, so keeping your body healthy can also help to keep your brain working properly." " Lifestyle changes to improve diet and mood might help people with MCI to avoid dementia, and bring many other health benefits. This doesn't necessarily mean that addressing diabetes, psychiatric symptoms and diet will reduce an individual's risk, but our review provides the best evidence to date about what might help." " Some damage is already done in those with MCI but these results give a good idea about what it makes sense to target to reduce the chance of dementia," added Prof. Gill Livingston, also of the Psychiatry Dept. at UCL.
" Randomised controlled trials are now needed." While the advantages of a healthy lifestyle - in terms of diet, exercise, fresh air, social interaction and so on - are often mentioned, it is interesting to find statistics linking conditions such as diabetes, depression, mild cognitive impairment (MCI) and dementia as familiar to carers of people with Alzheimers disease. (See also other news re. diabetes). Health News is included on the IvyRose website to inform visitors about current health issues and research, but not to endorse any particular view or activity. Any views expressed in the article above are not necessarily those of IvyRose Ltd.. Material in this news item was released by the source indicated below on 20 February 2015 and may have been edited (e.g. in style, length, and/or for ease of understanding by our international readers) for inclusion here.